A classic scene of an adult Great Blue Heron ready for hunting action. A soon to fledge Great Blue Heron tests the wind as it waits for an adult to return to the nest with food. 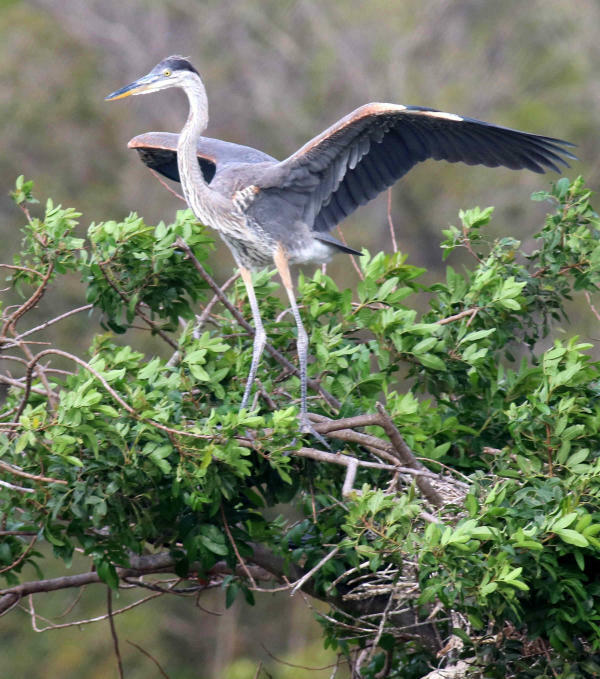 Among the most common and widespread big birds in North America, Great Blue Herons inspire beginning birders, children, non-birders and veteran birders alike. Any such tall bird with a long pointed beak and an expansive wingspan commands the attention of people and all small animals. 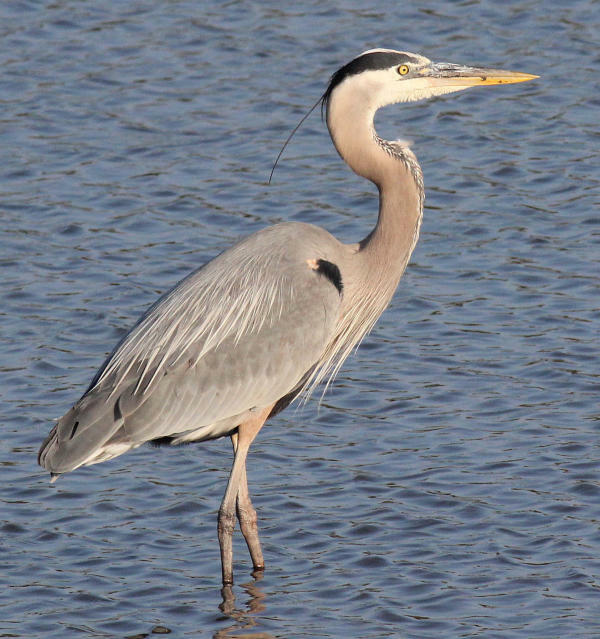 Although they are obviously not a bird of prey, Great Blue Herons are serious hunters that prey on fish, frogs, crayfish, and large dragonfly larvae in shallow water, but on dry land they easily catch and feed on small mammals including mice, voles, large insects and small snakes as they ply open grasslands and fields for suitable prey. Witnessing the activities at a large nesting colony is both exciting and impressive. At first, it’s surprising to find them nesting in tall trees in rather flimsy looking stick nests, but to see several of these grand birds in flight at once, coming and going from nests where nestlings stand waiting to be next to be fed is inspiring for anyone. It always seems to be unusual to see such large long-legged, long-necked birds perched on a tree branch, or on a nest built high in a tree snag or a tall bush. It is interesting to note that you can find white morph Great Blue Herons in coastal South Florida, which have been considered a separate species at times. These “Great White Herons” resemble Great Egrets, but have a broader, darker-colored beak and the larger, bulkier in size of Great Blues. Whether you’re a birding vet or a beginner, take your next opportunity to study a Great Blue Heron at close quarters to really take a close look at its plumage, its plumes, its eyes, the calculated movement of its legs, its stealth mode with its neck cocked and held ready for action, followed by the fast strike of its sword-like bill, either grabbing or stabbing it’s quarry. What an effective hunter, in water or on land. Range: Throughout most of southern Alaska and Canada across the continent to southern Mexico. Winter south to northern South America. Habitats: Shallow wetlands, shorelines of lakes, rivers and ocean coasts, plus they occasionally hunt in open grasslands, meadows and hayfields, usually near a wetland. Mating: Pair bonds are strong, and pairs share nest building, incubation, feeding and care of nestlings and during post-fledging; however, new pairs are usually formed subsequent years. Pairs display at the nest, conduct circle flight displays, stretch neck, raise crest, fluff neck feathers and clap bill. Nest Sites: Nest in colonies, usually species-specific nesting colonies, but some pairs may nest in mixed-species colonies, and some nest in a solitary location. Clutch Size: Usually 3 to 5 light blue-green eggs. Incubation Period: 28 days; adults share incubation. Nestling Period: Both adults feed regurgitated fish brought to the nest from surrounding wetlands. Food: Mostly fish, but frogs, crayfish and large dragonfly larvae in shallow water, and on dry land they catch mice, voles, large insects and small snakes.